Just Catamarans is happy to announce the sale of a Silverton 43 Motor Yacht, built in 2002. 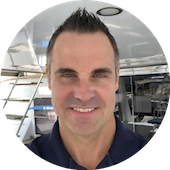 Just Catamarans broker Jim Ross represented the Buyer. ASSISTED LIVING is powered with low-hour Cummins Diesel engines, a Kohler generator, and features a two stateroom layout each with a separate head. Lying in Vero Beach, FL ASSISTED LIVING was listed for sale at $170,000. Contact Jim Ross to help sell your yacht or Catamaran.